Cultivating collaborators—What does “cultivate” mean here? Another way to express this is to ask: “How do people become skilled and effective in contributing to collaborations? How do we lead others to develop their interest and skills in collaboration?” Implicit in these questions is the idea that being able to contribute to collaborations is not something that can be taken for granted. Instead, people need to learn, practice, and improve at it. “People” includes each of us. Once we get in the swing of cultivating ourselves as collaborators, we can help foster the interests of others in developing their skills. “Cultivate” focuses attention on the process of improving as a collaborator, not on the endpoint. When we cultivate plants we have an endpoint in mind, say, a good yield of tasty tomatoes or a vibrant array of colors of zinnias, but we know very well that there are many tasks between the end of winter and the harvest. Consider this analogy with playing soccer. You certainly know the goal, namely, to get the ball in the goal. You watch a number of wonderful soccer games and some woeful ones, so you know what it looks like to be a player in a good soccer team. Amazingly, the national team’s coach happens to be best friends with one of your neighbors from college days and has agreed to coach a group of you in the off-season. Alas, this neighborhood team doesn’t end up playing very well. It turns out that although you all know what a good team’s play looks like and couldn’t ask for a better coach, you need to spend time developing your personal and interpersonal skills as soccer players. You need to get fit, to get over your fears from having been injured in the past, to practice 1-touch, 2-touch, and dribbling skills, to learn the ways that other team members tend to hold onto the ball or to slice it when passing, to get used to the various positions or zones on the field, to express your emotions with sympathetic friends after being balled out by the coach, and so on. Now, many of these skills you can practice by yourself or in small groups outside of the context of a soccer game. And, when you do get to implement them in a game, you can take stock of how it went and make plans for what to focus on in preparing for the next game. “Cultivate” is also meant to steer our thinking away from prescriptions to more individualized pathways. Just as each task in the garden could, in principle, be described and each preparation in the soccer training spelled out, we could lay out the skills to be cultivated as a collaborator. But that does not mean the end result should be the same or we can say what path any particular person should best take. In this spirit, a workshop on “cultivating collaboration” might: get the participants acquainted with a range of tools and processes; try to make the experience one that stimulates the participants to practice and experiment with the tools and processes and to evaluate, reflect on, and learn from the experience; and convey the expectation participants build a tool kit relevant to their own personal and professional background and challenges. Constructivist learning aims to provide students with experiences that guide them to build an understanding for themselves instead of being handed a pre-packaged understanding produced by others. Conceptual change learning extends this further by noting that students come to a learning situation with existing understandings, however rudimentary and incomplete, and these “private universes” need to be exposed and mobilized in order for appropriate constructivist learning to be fashioned for them. 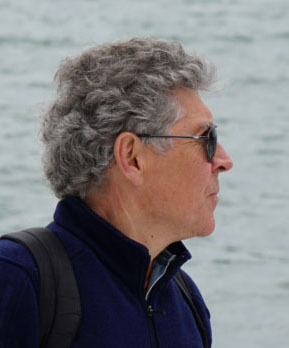 The net result of constructivist, conceptual-change learning can be seen as contributing to the topic if the topic is not simply the ostensible subject of the course, but the challenge of generating conceptual change for persons X, Y, and Z related to the subject. This perspective suggests that Connections might refer not only to connections among participants of the course that stimulate and support contributions, but also to connections among the elements of the subject matter (within and beyond the course proper). Connections are enhanced by Tools & Processes. Following the model of daily writing in recent workshops (see recent posts), these tools and processes might well begin with daily writing where students are asked to write about the topic, that is, about the subject and how it is understood by them, from the start, thus instituting active learning from the outset. Why are Open Spaces workshops appealing and necessary? The answer to the title question is that Open Spaces Workshops should not be necessary. (Continuing the daily writing after the workshop “Open Spaces for Changing Science and Society.”) They are appealing because the processes foster the interactions and insights that we hope for in other realms, namely, that of the academy or of activism and public engagement. Ideally then, we would be employing those processes in the other realms and open spaces would not be needed. At first sight, this leads to the question: In what ways are the open spaces processes closed off or closed down in the other realms? This is a subject for investigation. I notice, however, that I’m personally more inclined to create an open spaces workshop (or allied processes) away from the customary work, with its closed down processes, than I am to study and open up the closed processes from the inside. 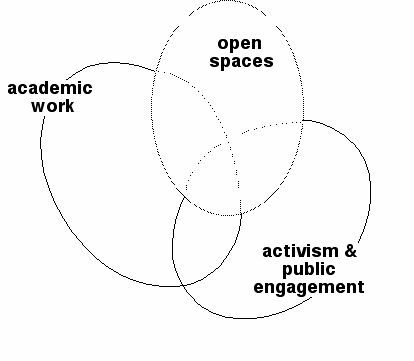 Admitting this leads me to a second question: In what ways can open spaces experiences be mobilized to bring about shifts in the conventional academic or activist realms? One answer is through activities that promote a little the Respect aspect of the “4Rs,” which make it more likely for little Risks in which participants in the activities stretch beyond the customary and for little Revelations to affirm these Risks. The steady experience of these Revelations or insights leads to Re-engagement in the realms of our customary work. 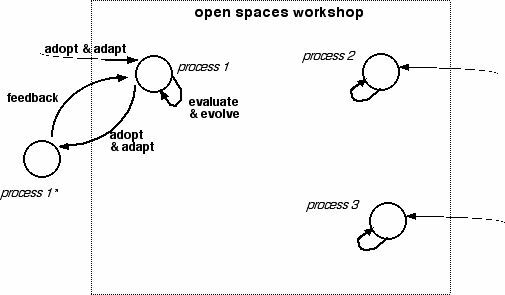 In brief, the schema of open spaces workshops consists of three contrasts or movements: Here & now vs. Subsequently; Tangible outcomes versus Experiential; and Process as Product (Tools & Processes and Connections) versus conventional Products. The idea of flexible engagement is that people’s experience of engagement prepares them to seek out and pursue other engagements in a similar manner. In the same spirit, people’s experience of contributing to the topic, such as, creative thinking in epidemiology or any of the themes of the NewSSC workshops, could prepare them to support others to contribute to the topic. Indeed, the same schema could apply to projects and endeavors other than workshops. Where contributions to the topic in the schema for workshops refer to insights about new directions for participants’ research, writing, teaching, outreach, we might also consider policy-making, activist-campaigns, media-production, etc. The same idea that the experiential dimensions make it more likely that the here & now (during the workshop) continues on to the subsequently (after the workshop) apply. Adopting and adapting tools and processes to conduct an open-space workshop is to be expected, as is equivalent borrowing by participants afterwards (see schema below). At first sight then, the only reason that a process-oriented person in an would not be in favor of the open source process of adopting and adapting is if someone privatized the common resources. We could add nuance to this view if we had a more general analysis of the trajectories of open source projects from the ideal to the less-than-ideal outcomes. Suggestions welcome! Here & Now Tangible Outcomes Learn or refresh tools.Participate in processes.Practice facilitating processes (optional). Establish or thicken connections among participants. Probe, clarify, expose open questions.Insights about new direc-tions for participants’ research, writing, teaching, outreach.Daily Writing. Tangible Outcomes Cultivating ourselves as participants, collaborators & question-openers.Adopt, adapt, evaluate & develop tools & processes. Connections maintained & developed.Local (i.e., participants’ current realms) kept in tension with trans-local connections. Individuals move in the new directions.Compilation of daily writing—> Programmatic overview?